Healthy teeth and gums are a reflection of good overall wellness. Having a beautiful smile starts with good self-care and preventative dental appointments to decrease the risk of disease and decay. During your dental checkups, we tailor our services to your individual oral health needs. From preventative scale and cleans to early cavity diagnosis with digital X-rays, it’s our mission to help you keep your teeth strong and stable for life. 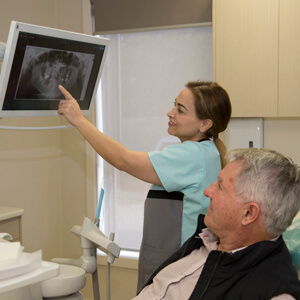 We also routinely screen for conditions such as oral cancer, bone loss and periodontal disease. Brush at least twice daily, for a minimum of two minutes. If possible, try to brush after each meal. Pay particular attention to cleaning along the gumlines. Floss a minimum of once per day. Wrap the strand in a “C” shape around the tooth and slide it up and down against its side several times, being sure to clean just below the gumlines as well. Limit snacking between meals and drink water frequently throughout the day. Use appropriate products that are non-abrasive and contain fluoride, to minimise damage to tooth enamel. Bad breath can be an embarrassing condition that affects both your private and professional life. Unfortunately, some people never realise that they have halitosis or they are too ashamed to ask their dentist for help. We understand this sensitive issue and offer honest advice on how to diminish the cause of bad breath and the bacteria that causes it. In some cases, it may not be due to gum disease, smoking or oral hygiene but rather an underlying medical factor. Our understanding providers will work with you to find the most effective treatment for your halitosis. Have you been delaying your preventative dental care because of a busy schedule? We’re open late as well as Saturdays to better accommodate on-the-go routines. Contact us today to make your first appointment.